In this story, we discover how Scott created a custom diamond that was a perfect fit for his one and only queen, Hannah. Hannah and I met while we were both working in the restaurant/hospitality industry, I was a server at the time and Hannah was hostessing. I remember always trying to find a way to walk by the hostess stand to see if she was working, maybe strike up a conversation with her to find out about her life and what her interests are. After a few conversations with Hannah up at the host stand, I finally built up enough courage to ask her out to some coffee – she said yes. The rest was history. Secretly I might have always known she was the one for me, from how she is an absolutely amazing snowboarder (a must for me), a loving, positive individual and someone you can always count on. But if I were to put my finger on the exact moment when I realized she was the perfect one for me was when we moved in together. Prior to us living together we would spend most every day/night together and it felt like I was hanging out with my best friend.. We would cook together, do work together, and motivate each other every day. The I finished unpacking my last box from us moving in together I felt a very warm, homie feeling come across me and I knew that I was making the best decision for my life to date, and knew she was a person I would like to spend the rest of my life with. The proposal took a few months of planning between all of the coordinating with my parents and her parents. 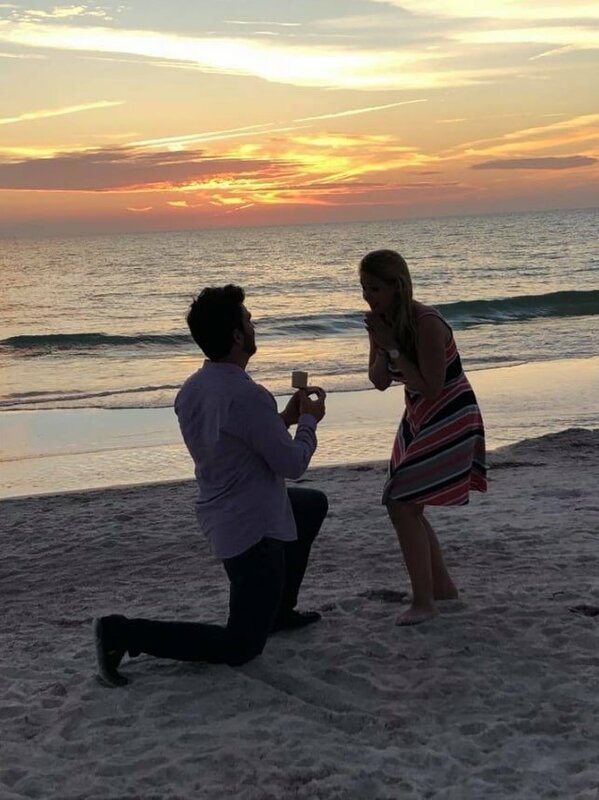 I proposed to Hannah in Florida where my family owns a house, her family lives in New Mexico, so I needed to figure out how to get them down to Florida without Hannah knowing. Anyway, it all started out with me wanting to propose to Hannah during sunset on the beach, which quickly morphed into us walking down the beach during sunset with a premeditated end destination disclosed to all family members to meet for my moms “anniversary dinner”, but really was to surprise Hannah. Turns out racing the sun isn’t all that easy and can create some internal anxiety once realizing your losing the race. Hannah and I grabbed our whisky drinks and began our walk down the beach, Hannah was having a blast the sunset was beautiful, beach going families were taking selfies, and being the genuinely nice person Hannah is, she was offering to take pictures (not realizing I was on a time table). I was gently encouraging Hannah to move faster down the beach and she replied “it will be okay, we can be a few minuets late, lets enjoy this”. As I am wiping the sweat from my face from being so nervous we continued our walk down the beach. Eventually we arrived at the destination point down the beach (about a mile), I turned to Hannah, reached for my waistband and pulled out a box and promptly told her among some other things that I loved her asked her to marry me! 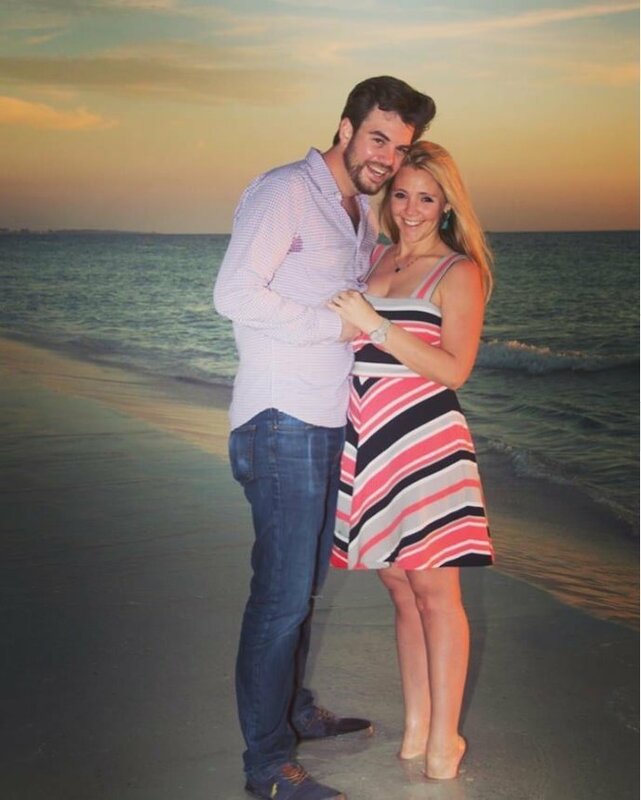 Just as she said yes, her family and my family ran out onto the beach to surprise her, the photographer popped out of the bushed and began capturing the rest of the moment with our family. It all ended with tears and hugs of joy, and random beach goer’s extending their congratulations. It was picture perfect! The ring is not only the most beautiful thing I’ve ever had the pleasure of creating, but it looks even better on Hannah’s finger. I couldn’t give more thanks to the owner Kaeleigh at the Diamond Reserve for walking me through all aspects of diamonds, their character traits and subtle qualities. I never felt pressured, only felt like a family member of hers, she made sure to present me everything I asked for. She listened to me when I described Hannah’s style and how I wanted the ring to be timeless and classic. I absolutely love the diamond I picked, and love it even more that Hannah loves it. I’m not going to lie, designing a ring for someone is extremely nerve racking, but when the finished product is on the finger of the one you love and she loves it, that is a moment that feels REALLY good! Kaeleigh, you ROCK! Denver while we were both in school. as the lows in life. As we spent countless adventures together as well as some lows you really can determine if we could rely on each other in all aspects of life. Scott is truly my other half in anything we confront. I can’t imagine life without him and that’s how I know he is the one. scent. I spent my first Christmas away from my family and we flew to his mother’s new house on Anna Maria Island in Florida. He asked me to walk the beach with him after a long day of boating, paddle boarding, and fishing. The sun was setting and of course all I wanted to do was stop and take selfies together and enjoy the beautiful walk. He on the other hand was sweating bullets and rushing me to get to where we needed to be. Shortly thereafter he stopped, grabbed my shoulders, and there was a moment of silence. I, being a little feisty at times stated, “oh now you want to stop” and he began to lift up his shirt. noticed a photographer was documenting this special moment. I was in heaven. All to my surprise down the beach comes my youngest brother and sister followed by my mom and dad and his whole family. 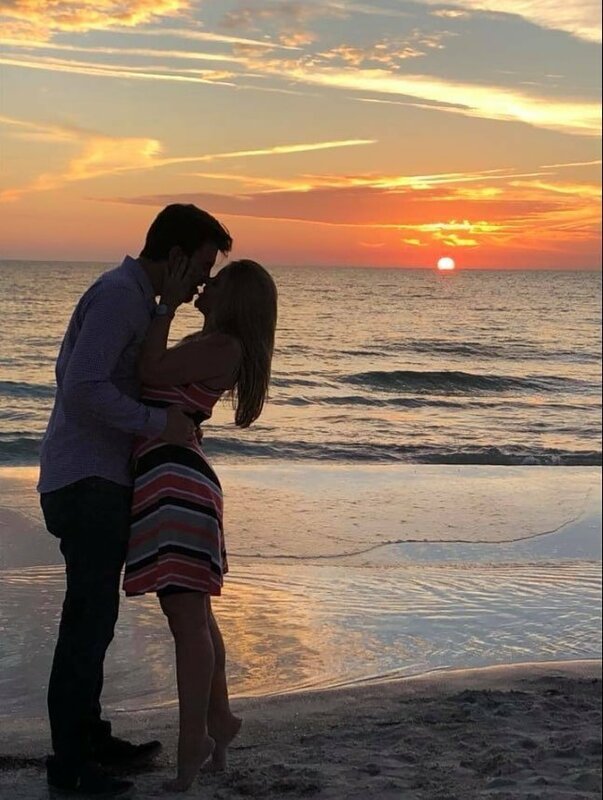 He had surprised me with not only getting down on one knee but coordinating my family being there and documenting it all at sunset on a beach. ring. With the help of the amazing Diamond Reserve Scott designed my dream ring. stone is the highlight and then there is a hidden surprise rim that supports it, making it look like a Queens’s crown. The band really just brings it all together highlighting but not taking away from the ring itself.